CG ARTWORK "The City of Gears"
CG Artwork! 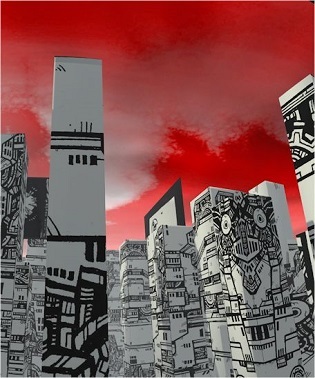 Towering skyscrapers sprawl above scurrying denizens, robot smoke stacks manipulate mechanized mass production, and chaos envelops twisted war torn landscapes; enter "The Virtual metropolis". 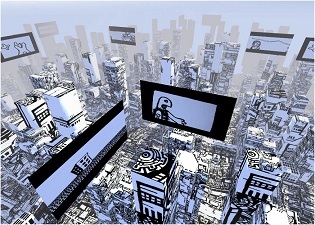 This animated artwork uses an innovative combination of computer generated and hand drawn images depicting a series of imaginary environments that the audience can explore and manipulate using a keyboard, muse or game controller. The idea behind the interactive installation is to present a dream like navigation between various thematic landscapes exemplifying the unseen relationships each area has with the other. 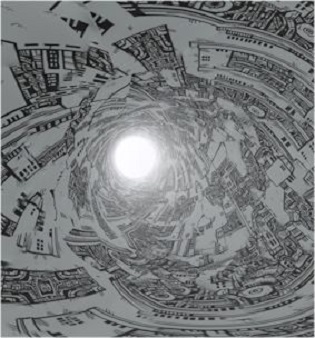 Featuring cities, factories, forests, war zones and metaphysical interiors the work investigates man's connection and responsibilities regarding nature, technology, progress and self. In addition to the interactive platform a unique series of mixed-media digital drawings on canvas has also been created. 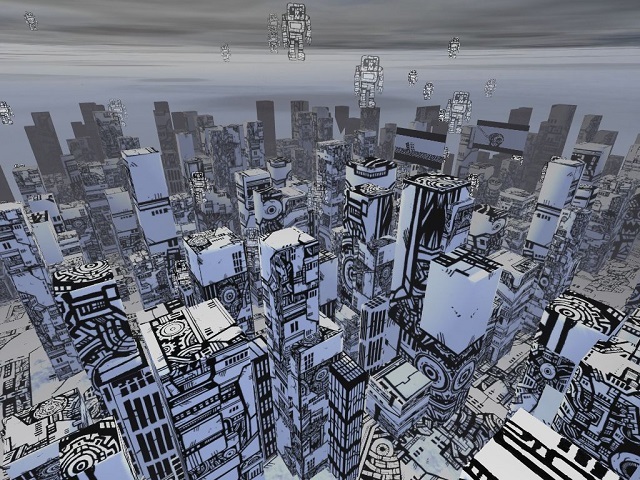 The "Virtual Metropolis" is a collaborative creation between artist Mike Parsons and graphics visualization specialist Michael Peters. The gallery installation of the "Virtual Metropolis" combines interactive video projections with 2d dimensional works on canvas. Using multiple screens intermittingly placed among several wall 2d paintings the idea is to create an all encompassing virtual environment in which the audience becomes completely immersed amidst the strange and surreal imagery. Like the video work itself the integration of still and animated imagery is designed to blur the lines between fine art and the video game challenging the viewer to question and compare the two mediums. Ideally this installation should take place within a 20 x 20 ft enclosed cube with projections and or digital paintings covering all 6 walls. The work is also designed for multiple locations where the audience with restricted communications. In these cases the audience may become aware of the other participants through sound effects, visual manipulations or text messaging challenging them to interact creatively rather than directly. 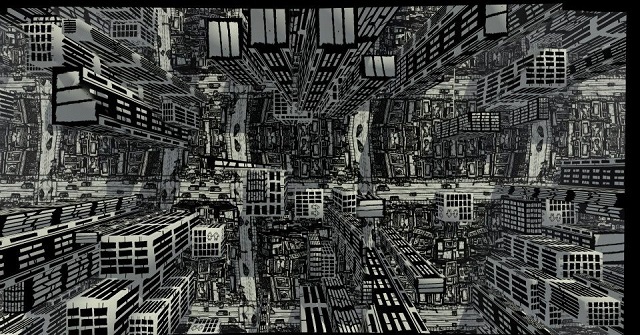 The Virtual Metropolis digital canvas' collection is created using a similar process as the interactive video installation. 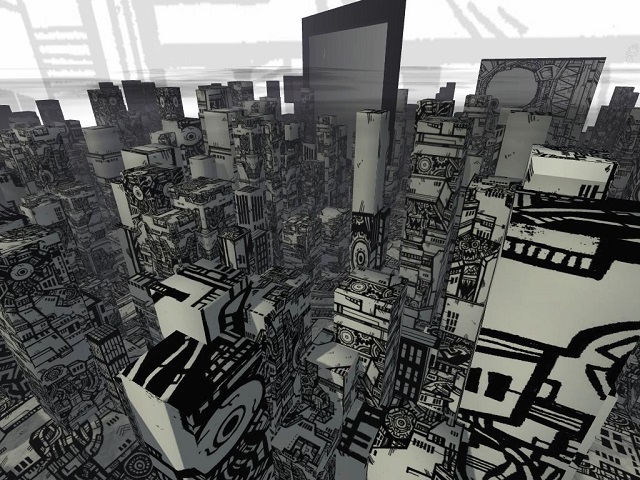 The work integrates a series of detailed thematic pen and ink drawings onto a 3D generated landscape. Once these worlds are rendered we use a modified video capture to create oversized one of a kind still image landscapes. These high resolution files are then printed onto canvas in 1/1 edition using archival quality inks. After printing a small area on each canvas is revisited with pen and ink adding a final hand-drawn component to the artwork. 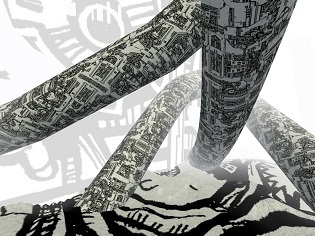 In essence the work goes from traditional pen and ink to computer generated back to traditional pen and ink resulting in both an entirely original fine artwork and a semiotic interpretation of technological relations. There are 15 l/1 canvas in this series ranging from 1 x1 feet to 4 x 8 feet. The entire set was featured at the Robert Kananj Gallery from Sept.-Oct. 2012.